Neighbors are concerned about falling debris and concrete falling from a bridge. 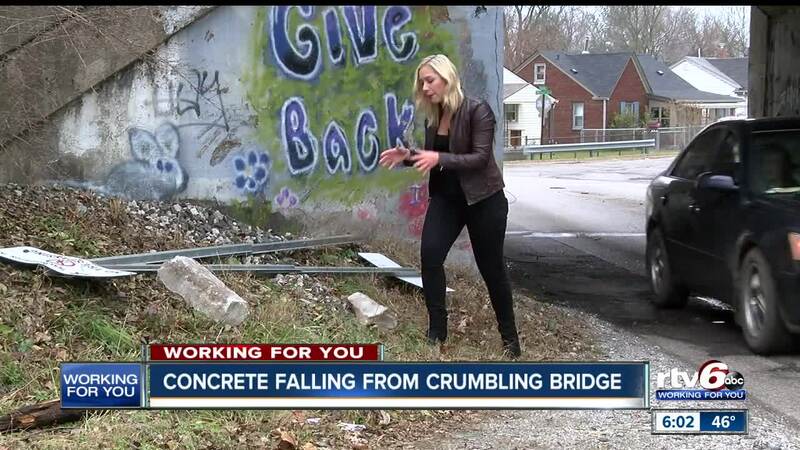 INDIANAPOLIS — Debris and concrete falling from a bridge on the city's west side has neighbors concerned someone walking or driving will get hurt. Some might have to swerve around debris and pieces of concrete while going under a rail bridge near Holt and Rockville road. "A child, or anybody, who's walking under there and one of those pieces fell - it would kill you," Mike Lachance, who lives near by, said. "But even if it came through the sunroof of your car, or in through your windshield, it would cause you to have an accident, or whatever it is. It's just generally unsafe." RTV6 contacted CSX, who owns and maintains the rail bridge. CSX sent a crew to inspect the area. They are in the process of developing a plan to fix the bridge.